When both partners retire, they are often left with a lot of free time. More recently, many retired couples have been travelling and exploring the world. With all the free time and no worries, it is a great idea. However, picking a suitable RV can be a tough decision. It all comes down to personal preference and what you want in a travel trailer. Each trailer will have their own features that will stand out and will also have features that put you off. 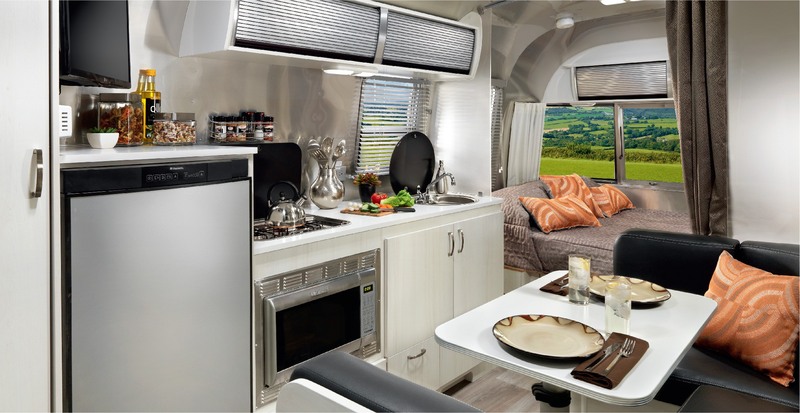 Below are 3 of the best small RV for retired couples that we think you will love. Not only are they stylish, but they have some amazing features and are perfect for getaways. 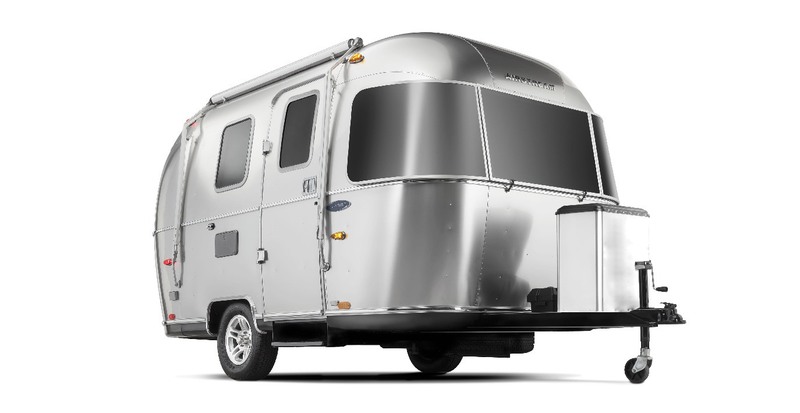 The Sport, by Airstream, is a very lightweight and compact travel trailer. It comes packed with a ton of features which is surprising for the size. The Sport is able to sleep up to four people, so is a perfect size for a retired couple. Due to its size, it won’t require a super powerful vehicle to tow it either so your standard SUV will do the job. Simply hook up the trailer, make sure its secure and set off to your next destination. Inside, you will find a nice kitchen containing a 2-burner cooktop, a nice little seating area with table to eat your food and a stainless-steel sink. Other features include a JVC stereo, LG LED HD TV, Flatware organiser and more. When you buy this trailer, you can choose between two interior décor option. This means you can match the interior to your taste and have a trailer you love. Not only that, but The Sport features ‘ultra-leather’ furniture which is said to be better than leather by many. The bedroom is the perfect size for two and comes standard with a pillow top memory foam mattress, a quilted bedspread, pillows, under bed storage and a wardrobe. This trailer definitely has a great amount of space to pack what you need. If you are interested in The Sport by Airstream or want to view their bigger travel trailers, then head over to their site, get in touch or download the brochure. The Legacy Elite is a sleek, compact little travel trailer with some great standard features. This travel trailer is able to sleep 3 people and can seat 6. 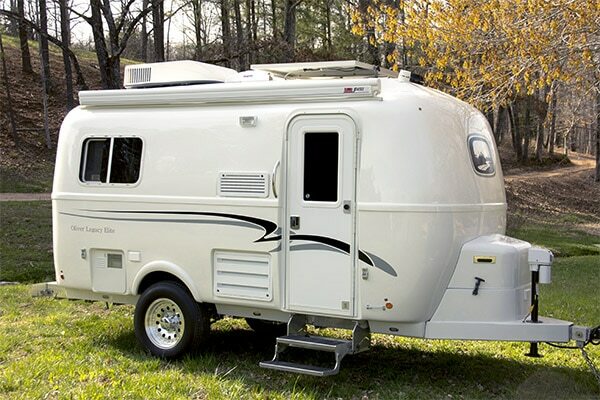 For a retired couple, this is a great travel trailer as its not overly huge. Inside has a very clean feel and the interior is very stylish. Not only that, but you have the option to change certain bits such as the interior colour etc. 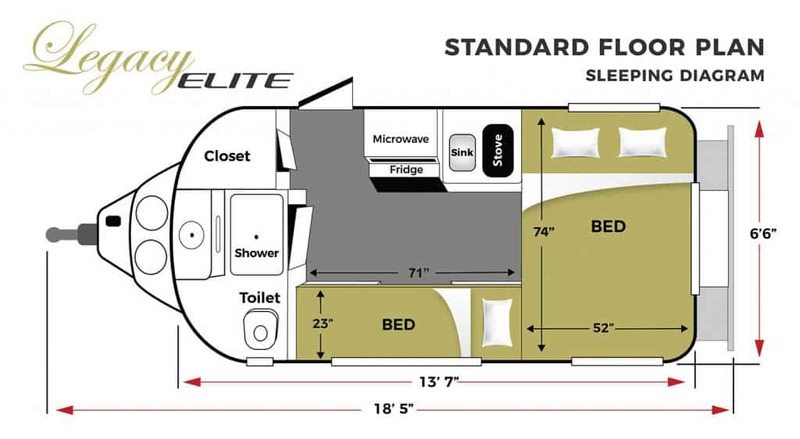 As standard, the Legacy Elite will come with a side and rear dinette, that converts into beds, a 22” LCD TV, a radio, custom mounted speakers and a coax for your TV satellite. Other features that come standard include full surround over-head storage, remote control ventilator system, self-igniting furnace with central heating, LED overhead lights and much more. Fancy changing the exterior colour, this can also be done when purchasing the Legacy Elite. Due to its size, everything is very compact as you can see from the floor plan above. Regardless of this, you still have your kitchen, seating areas, a place to eat and a place to sleep. If the Legacy Elite sounds perfect for you, grab the brochure from the Oliver Travel Trailers website or alternatively, get in contact with a dealership that sells these travel trailers. 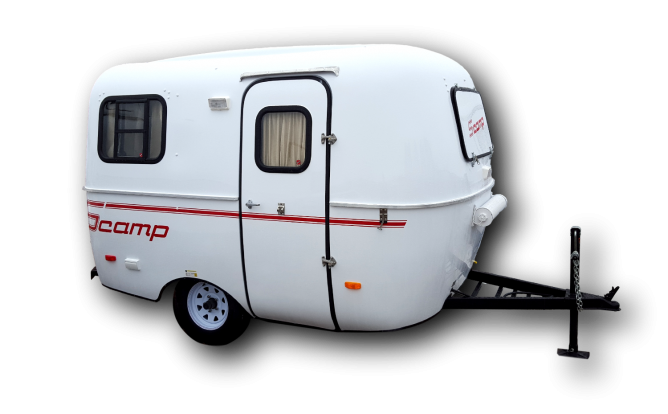 The 16’ Deluxe Trailer by Scamp is super stylish and perfect for a stylish retired couple. 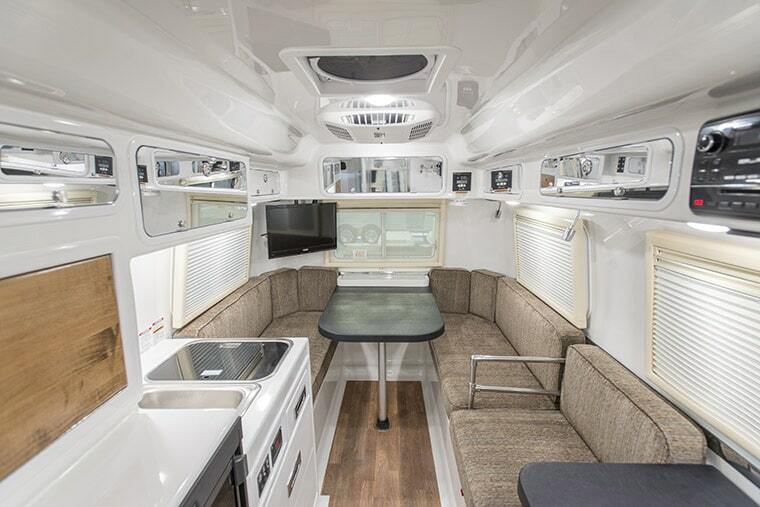 If you go for the Scamp 16’ Deluxe, you will be able to custom outfit your trailer with a gorgeous hardwood interior. Not only that, but they offer two different layouts. The only differences in layout is where the side dinette table and shower is located. Depending on what layout you go for, there may be limitations on what you can fit inside the trailer. However, this is outlined on the Scamp Trailers website. The trailer itself is constructed with fiberglass and looks great. As it is only 16’ in length, this trailer won’t be a huge struggle to tow. As long as you have a 2-inch ball hitch, you will be able to hook it up and set off. Inside, you have the option of oak or birch cabinets. In the kitchen area, you have a two-burner propane stove, a sink and draw for cutlery etc. Storage wise, you have a closet with shelf and a lot of under seat storage. Other features include safety chains, 10” electric breaks, carpet or vinyl flooring, gravel shield, 4.6 cubic foot fridge and more. Above we have 3 of the best small travel trailer for retired couples. Each trailer has its own pros and cons but they all boast the same compact design. This makes these 3 trailers perfect for retired couples looking for a small travel trailer. Not only are they small, but they all have their own stylish and useful features. Just remember that if a certain feature puts you off, you can speak to the company, in most cases, and customise them the way you want. We have included the base starting price for each of the 3 trailers. However, prices are subject to change and these are average prices of the trailers above in new condition. Also, additional features and packages will increase the original cost. If you are looking to rent one of the above three, getting in contact with the companies will be your best bet as they can point you in the right direction. From there you will be able to find the best deals on finance or being able to rent a travel trailer.